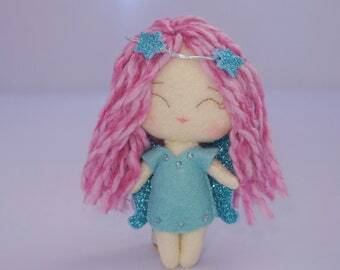 The dolls were very cute and the recipients love it very much! Seller was very reliable and on time. Communication was very good as well. Highly recommended! <3 I love it so much. The little details are great. !!! I'm always telling people to order custom dolls from this shop. hi! my name is linda. i'm from bandung, Indonesia. i love to see and make something colorful. i like green tea and i also obsessed with felt . i'm 27 years old and not married yet. actually, i'm an physic engineer,,,but choose crafter as my job. almost all of my feltworks are designed by me, cut by hand , handstitched, and a little bit help from glue . no mechanised cutters or sewing machine. i make something unique , so even i make hundred item with same design, each of them are unique because it's handmade, not a mass production. I started my Felt journey when i was in college, and fell in love with i , so i decided to be a felt crafter as my main job. hi! my name is linda. i'm from bandung, Indonesia. i love to see and make something colorful. i like green tea and i also obsessed with felt . i love felt a lot, so i always use felt everytime..
custom item is non refundable and non exchangeable. sorry.. :) make sure about your order, i'll do my best to make your item. if you're not satisfied, please convo me , i hope we could find the best way to work things out. *ship items within 2-3 business days after payment CLEARS (I would appreciate if it's no longer than 2 days - 2 x 24 hrs). But if you need an item shipped immediately, feel free to convo me! *for custom item will take more time, about 5-8 days longer. *Any taxes or fees upon entering your country's customs are the responsibility of the buyer. *All packages are shipped via Registered Airmail from INDONESIA , with tracking number, without insurance. it could take 14-30 business days . Registered airmail need to be signed for upon delivery. If no one is available to sign for the package, the postal service will leave a notification with further instructions for pick-up or re-delivery, and it is the customer's responsibility to follow through in obtaining the package. *if you want to get your package faster, i can send it via EMS from SINGPOST with additional cost . it will take 4-7 business days.please convo me for the exact shipping cost. *i will use your etsy address as your delivery addres . so if you want to deliver to somewhere else, please note me the address. please make sure that your address is right, because i can't responsible for item that sent to the wrong address. please include your telephone number just in case that you're not home when the package sent to you. *there is no guarantee that you will receive the package in those time frames since I do not have any control on the shipping process once I deliver it to the Postal Service. I cannot give you an exact delivery date or promise that your package will arrive by a certain days, as there are no guarantees made by the postal service as well. *If a parcel goes missing on route to you I will do everything I can from my side to help locate it, but ultimately once it has left my hands and is with the Postal Service I have no control over it.